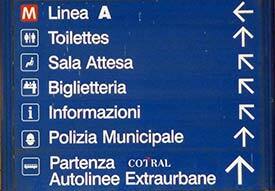 Buses from Ciampino to Metro line "A"
The bus fare was €1,20 the last time we checked. 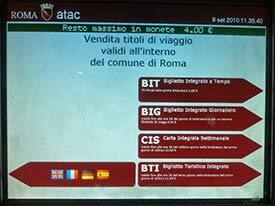 You'll also need to buy a €1,50 "Metrebus" ticket for the Metro at the Anagnina station, bringing your total fare to €2,70. This bus-Metro combination is a great choice if you're traveling without heavy luggage and your hotel or apartment is near Spagna, Barberini, or another station on Metro Line "A." 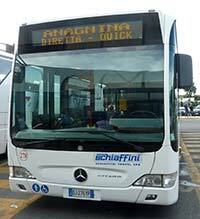 On this page, we'll show you how to reach Rome from Ciampino Airport by bus and Metro. 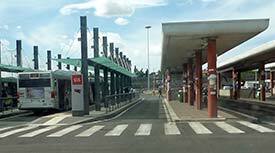 If you're going to the airport, simply take Metro Line "A" to the end of the line at Anagnina, go upstairs to the outdoor bus station, and look for the Ciampino Airport stop. Exit the terminal, go to the bus bays, and look for the white transit bus with an electronic sign that reads "ANAGNINA DIRETTA - QUICK." Buy a ticket from the driver and board the bus. 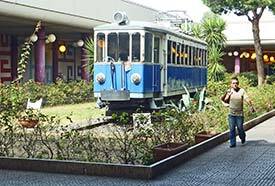 About 15 minutes after leaving Ciampino Airport, you'll arrive at Anagnina, which is a major underground, suburban bus, and park-and-ride station at the end of Rome Metro Line "A." Follow the crowd to the steps and go downstairs. 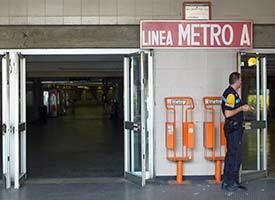 Admire the vintage tram on the station's lower level, then head left toward the Metro entrance. The Metro entrance is clearly marked, so you're unlikely to miss it. 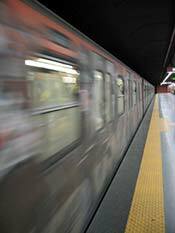 Next, go to the barrier and insert the ticket in the slot on the front of the turnstile, as described in our Rome Metro article. Retrieve your ticket from the top of the turnstile as the gates open. Go to the platform and wait for a Metro train to arrive. Trains run every few minutes, so you shouldn't have to wait long. 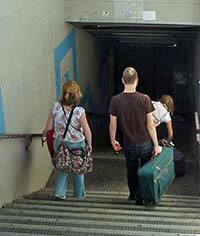 When the train arrives, stay behind the yellow line until the train has stopped. If necessary, press the large button by the doors to open them. 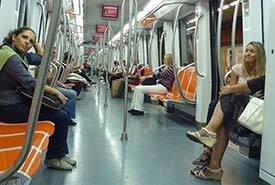 The most Metro popular stops for tourists are Spagna, Barberini, Repubblica, and Termini. If necessary, you can change at Termini for Line "B," which will take you to other destinations such as the Colosseum, Circus Maximus, and Rome's intercity Bus terminal at Tiburtina. Bus to Metro Line "A"